Not sure where your loyalty lies in the great BBQ debate? Let our guide to the different cuts of meats and sauces help you out. No matter where people live in the North Carolina, when it comes to BBQ they can all agree on the sauce used and that it better be smothering pork and pork only. The meat is slow roasted over oak coals for up to 18 hours so that it’s incredibly tender and smoky. A simple and tart vinegar based BBQ sauce is then very lightly added to enhance to the smoky flavor of the pork. The subtle hints of acidity and spiciness pairs well with the slightly burnt, yet succulent and woody-tasting meat. For a true experience head to the award-winning Skylight Inn in Ayden, North Carolina. While it’s been featured many times and even received a James Beard Award, its menu is incredibly simple. Order the “Meat w/ Bread & Slaw” for a traditional and no-frills experience that will leave you wanting more. Wilber’s Barbecue is another famous spot for delicious oak-smoked pork BBQ in North Carolina. It’s hosted an array of dignitaries such as former presidents George W. Bush Sr. and Bill Clinton, who have raved about the tasty meat served up here. Whole hogs are roasted over hardwood coals and cooked up to juicy perfection. And don’t forget to try the hush puppies! Memphis is known for its slow cooked, tender, and savory rack of ribs. The key to getting the pork to its fall-off-the-bone tenderness is smoking it slowly over a low hickory fire. They are known for their dry rub, which is typically paprika-based, that gives the pork its distinct reddish color. The rub usually makes the meat so flavorful that sauce isn’t needed. However, if you prefer your meat “wet”, try out their thin style of sauce that’s tangy and sweet, incorporating both vinegar and tomatoes for flavor. The longest operating restaurant for classic Memphis BBQ is Leonard's Pit Barbecue, which has been serving up mouthwatering meat since 1922. The recipes here have been passed down since the place first opened, so you’re sure to get a taste of BBQ history. Be sure to order the rib plate with two sides, the beans and the spaghetti, and be prepared to swoon over the smoky meat with its crispy crust. For someplace a little less touristy, head to the downtown location of Central BBQ. This place is beloved by locals for its tasty pork with extra “bark” (the dark and crispy crust) and fresh cut potato chips with house seasoning. They say that everything is bigger in Texas, and that goes for BBQ too. 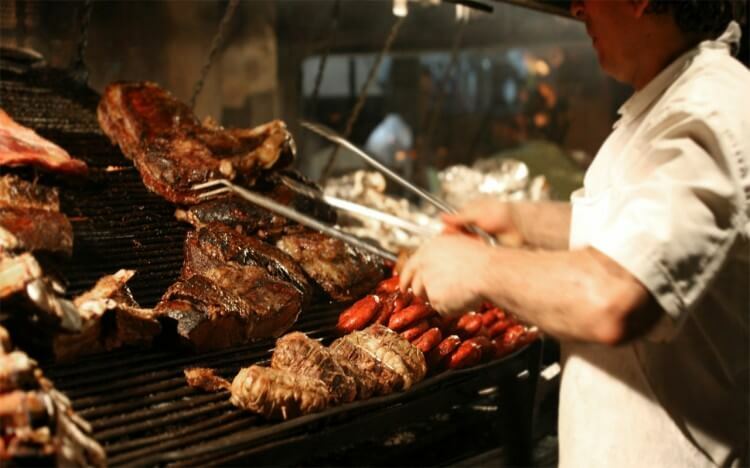 The tradition of BBQ in Texas runs deep - though when you hear “Texas-style” people are typically referring to “Central Texas-style.” Unlike the other big BBQ players, Texas likes to focus on beef – usually slow cooked cuts of brisket over indirect heat. The use of beef over pork is tied to the historical cattle industry of the state. Most menus offer two different cuts of brisket - the leaner "flat" and the fattier "point." You’ll be hard to find to a place that doesn’t offer the complimentary classic sides of white onions, pickles, and cheap white bread. One other thing that Texas does differently when it comes to ‘cue, is that they don’t like to complicate their cooking. A rub is usually just salt and pepper and the smoke of the wood to flavor the meat. When finally served, a brisket should remain dry to not overwhelm the dish with sauce. For some true Lone Star State BBQ check out Franklin Barbecue in Austin. Though there’s sure to be a line (most of the great places have one – but they usually reward waiting patrons with samples of brisket as courtesy), at the end you will find what can only be described as BBQ nirvana. The signature item on this award-winning menu is, of course, their smoked brisket. The recipe was created by Aaron Franklin, a James Beard Foundation Award winner and one of the most celebrated pitmasters in the nation. Louie Mueller Barbecue, also known as a “cathedral of smoke,” is another Texas James Beard Foundation award winner for its high quality BBQ. This family owned restaurant has barely changed up the menu since opening its doors in 1949, and it’s no wonder considering it’s consistently considered one of the best BBQ spots not only in Texas, but in the world. Of course, ordering a fatty piece of brisket is the way to go when you’re here. In the early 1920’s, Henry Perry began barbecuing in an outdoor pit serving up slabs of meat wrapped up in newspaper to hungry workers in the garment district. His style of hot and peppery BBQ became so popular that fans began coming up with their own recipes to try and imitate his. After his death, Arthur and Charlie Bryant took over the business and added some sweetness to the recipe, which is now famous worldwide. With a reputation as a meatpacking city, no meat is off limits when it comes to slathering it up with a thick molasses-and-tomato sauce and roasting it slowly over hickory wood. Arthur Bryant’s Barbeque Restaurant is still the heart of Kansas City BBQ. Be sure to order the burnt ends, a Kansas City tradition, which are the end cuts of a fatty slab of brisket. Another famous institution is Gates Bar-B-Q, which has been open and family run since 1946. Their distinctive sauce is what put them on the map – so be sure to order the mixed plate of ribs, brisket, and ham smothered in it. While it now has six locations across the city, visit the flagship restaurant for a little piece of BBQ history. While beef and pork rule the BBQ world, in northern Alabama you will find that smoked chicken with white sauce is what reigns supreme. While many styles of BBQ are honed from a region, Alabama gets its style from a single man named “Big” Bob Gibson. Gibson is the mastermind behind the beloved mayonnaise based BBQ sauce that’s punched up with apple cider vinegar, lemon, and cracked pepper -the tang of which pairs perfectly with a grilled chicken leg. Gibson began smoking meats in the 1920’s, and while he found that BBQ sauce kept his pork tender – cooking his chicken for long periods of time dried out the meat. That’s when he came up with the idea of a mayo-based sauce that would ensure that the chicken stayed moist and delicious throughout the smoking process. Still open today, Big Bob Gibson Bar-B-Q is one of the oldest and most prestigious barbecue joints in the world. The restaurant has been open and had recipes passed down for five generations. While there’s plenty of ribs, and brisket on the menu – you need to try the chicken with the Original White Sauce, because a trip just wouldn’t be complete without it. Another great place for some signature White Sauce is Miss Myra’s Pit BAR-B-Q. Since 1984 they have been serving up tangy, creamy mayo-based BBQ sauce with their expertly-smoked chicken with perfect crispy skin. This local hangout is also known for their southern desserts, so save some room for the banana pudding.